The thefts occurred back in the mid-to-late 1980s, but the sale of documents stolen from the Baseball Hall of Fame’s famous August “Garry” Herrmann Papers collection sadly continues today. In late December, Clean Sweep Auctions, of Carle Place, Long Island, posted a 1924 letter addressed to Cincinnati Reds owner August Herrmann on its website as part of their February sale of baseball collectibles. It’s been posted on the site since December and currently has a bid of $165. 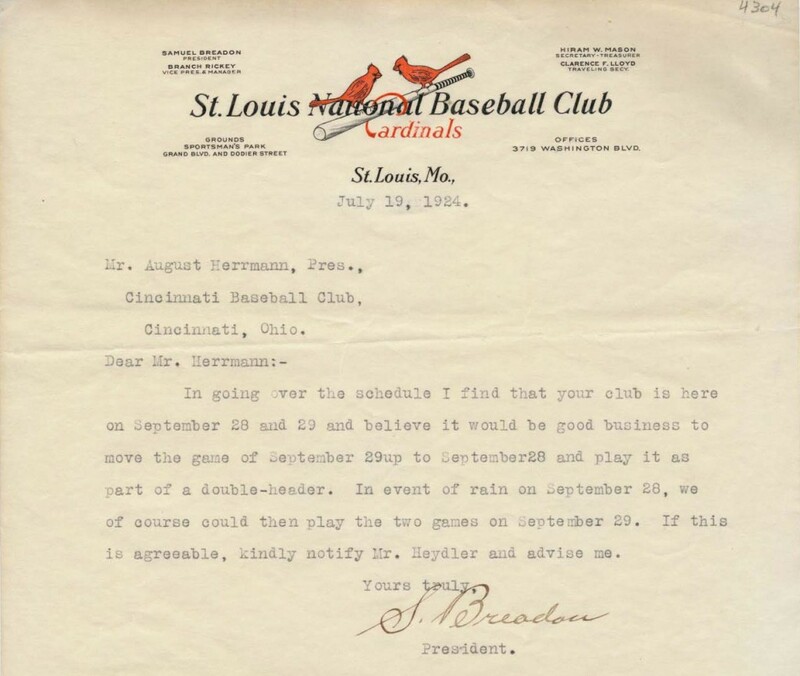 The letter was written by St. Louis Cardinals owner and president, Sam Breadon, who was asking Herrmann about a scheduling conflict for the 1924 National League season. Breadon owned the Cardinals from 1917 to 1947 and was one of ten finalists nominated for induction to the Hall of Fame in 2010 by the Veterans Committee for executives and pioneers. Last year, several similar documents signed by baseball notables, suspected to have originated from the Hall of Fame’s collection, were offered for sale at Heritage Auction Galleries and Robert Edward Auctions. 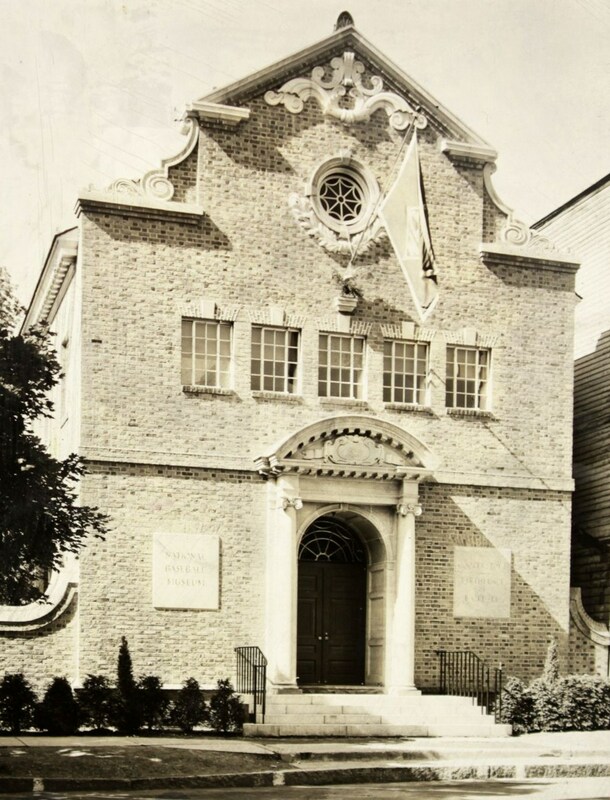 All of the documents were removed from those sales when auctioneers were informed that their auction lots were suspected to have been stolen from Cooperstown. In addition, reports in 2010 by Haulsofshame.com positively identified several rare photographs also stolen from the National Baseball Library. One photo, a rare cabinet card of Hall of Famer Mickey Welch was removed from Robert Edward Auctions’ 2010 sale and two other photographs of Christy Mathewson and Jake Beckley were sold previously by MastroNet. The stolen photograph of Christy Mathewson sold for over $12,000 at auction in 2008. Haulsofshame.com sent Clean Sweep’s president, Steve Verkman, documents illustrating the likelihood that his offered lot originated from the Hall of Fame files, as well as additional information showing that his auction house had previously sold other letters stolen from the Herrmann Papers archive. 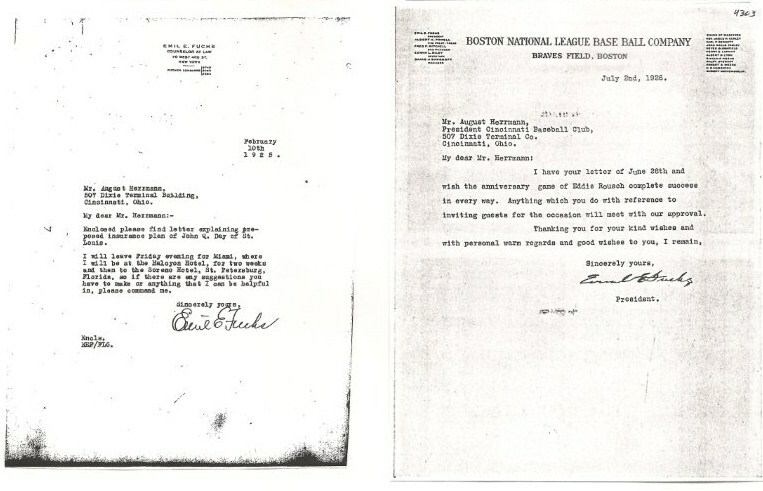 In 2009, Verkman sold two letters written to Herrmann from Boston Braves owner Emil Fuchs and National League President John Heydler. 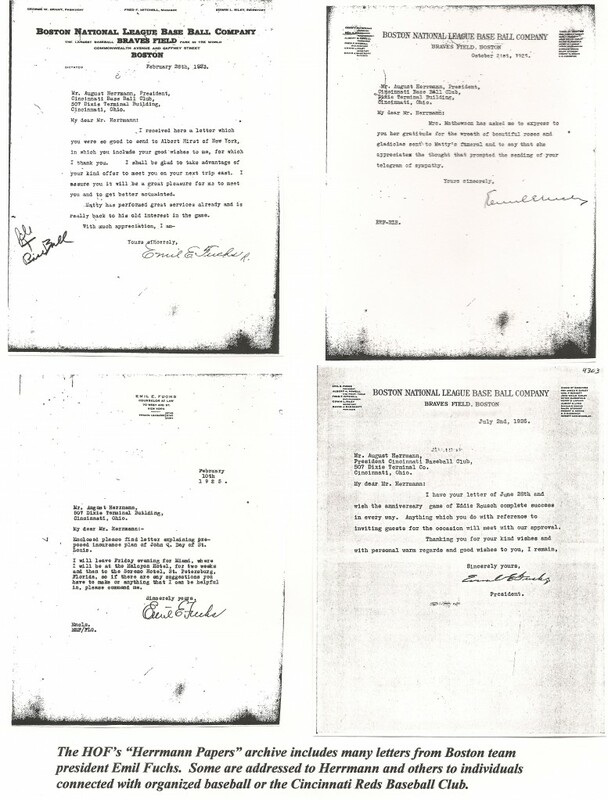 While the letters offered by Clean Sweep are only worth a few hundred dollars, other documents removed from Cooperstown have commanded sales prices in excess of $10,000. Sources indicate that Herrmann letters featuring ultra-rare signatures of Hall of Famers like John M. Ward and James O’Rourke have sold on the black market for even more. This rare letter sent to Herrmann by Hall of Famer James O'Rourke in 1916 was sold by Richard Wolfers Auctions in 1992. The pre-auction estimate valued the document at "$10,000-$12,500." The letter originates from the Herrmann Papers Archive and a file dedicated to all correspondence between O'Rourke and Herrmann. That file still retains at least seven letters from O'Rourke. The Herrmann archive was donated to the Hall of Fame in 1960 by Cincinnati Reds owner Powel Crosley Jr. and includes over 45,000 documents related to the operations of the Cincinnati Reds and Baseball’s ruling body, the National Commission. 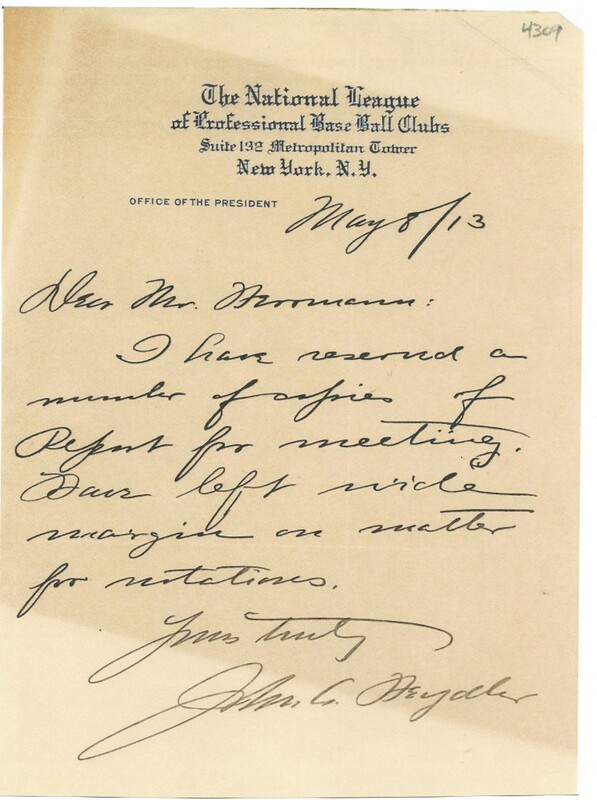 The majority of the documents are letters addressed to Herrmann and span from the years 1902 to 1928 during his career as Reds owner and Chairman of the National Commission. In 2005, the Herrmann archive was conserved and catalogued by the Hall of Fame and it appears that the Breadon letter for sale was part of a larger group of correspondence to Herrmann from the St. Louis team. The Hall of Fame’s Herrmann Papers guide shows that “Box 51, Folder 5″ includes all of the correspondence between Breadon and Herrmann between 1920 and 1926. We requested a copy of this entire file when we contacted Hall of Fame spokesperson Brad Horn on January 7th, but we were informed that Horn was on vacation until January 24th. In his absence, head librarian Jim Gates responded on behalf of Horn, stating that while he could not comment on the issue, he would furnish us with a copy of that file. That request, however, was still not fulfilled by the time this article was published. This letter appearing in the current Clean Sweep Auction originated from the Hall of Fame's HerrmannPapers Archive. It appears to have been part of a series of letters now found in "Box 51, Folder 5" at the National Baseball Library in Cooperstown, New York. Clean Sweep Auctions president, Steve Verkman, told us, “Clean Sweep Auctions is still researching this situation and has not been able to contact our consignor as they have been travelling extensively this month.” Haulsofshame.com first informed Verkman and Clean Sweep of the situation on December 30, 2010. 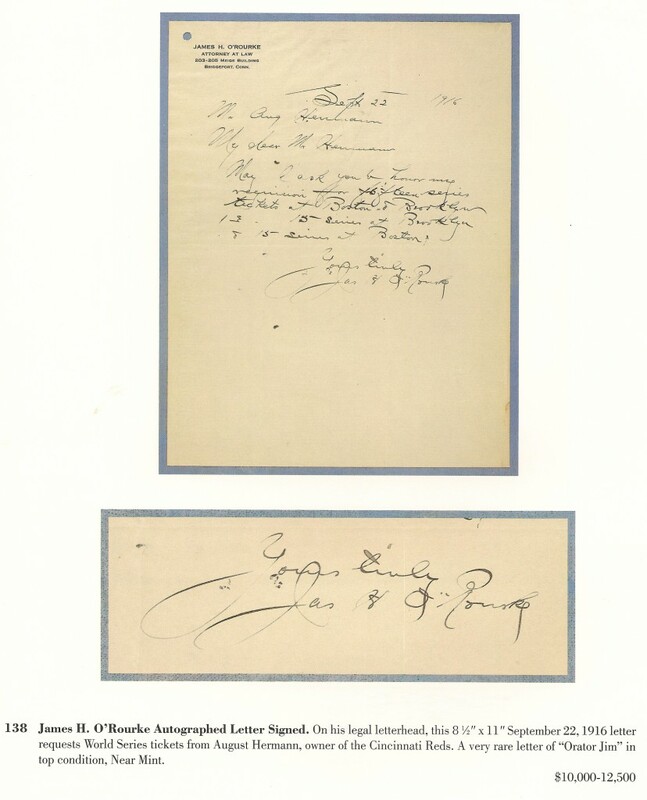 We also informed the Hall of Fame on December 30th about the sale of the Herrmann letter at auction. Sources indicate that the Hall of Fame has not contacted the auction house in regard to the Breadon letter or inquired about the Herrmann letters they sold in 2009. When we asked Verkman to go on the record about any contact he had with the Hall of Fame, he declined to comment. Records from the Hall of Fame also show that Clean Sweep sold a letter sent to Herrmann by Boston Braves president Emil Fuchs, which originated from a group of letters found in “Box 47, Folder 3″ of the Herrmann Papers archive. This is a page from a 2009 report submitted to the HOF illustrating the Herrmann documents stolen from their collection. The letter to the right, on the bottom row, was sold by Clean Sweep Auctions in 2009. All of the other illustrated letters were sent to Herrmann from Emil Fuchs (from 1923 to 1925) and are still housed at the National Baseball Library. The Hall of Fame’s reluctance to acknowledge the thefts and their apparent refusal to actively pursue recovery of the items that were placed in trust and donated to the institution, is creating a dilemma for auctioneers like Verkman of Clean Sweep and others. These documents have been sold at auction and on the black market for years, but the Hall of Fame has done nothing. Until, the reporting of Haulsofshame.com exposed how severe the problem was in published reports last year, the issue never garnered much attention. A detailed report submitted to the Hall of Fame by this writer in 2009 shows that at least $1 million in documents and photographs have been wrongfully removed from the Hall of Fame collection. The only public statements the Hall of Fame has made since news of the thefts were made public has been in regard to another problem on their hands involving the acquisition and display of non-genuine artifacts originating from the Barry Halper Collection. This past October the Hall admitted to the New York Post that an alleged ”Shoeless Joe” Jackson jersey in their collection was not authentic. The jersey was one of the premier items included in a $7 million deal Halper cut with the Hall of Fame, thanks to funds supplied by MLB. The Hall of Fame has also declined comment on several other fake items they accepted from Halper, including Mickey Mantle’s alleged 1951 rookie jersey and “Shoeless Joe” Jackson’s “Black Betsy” bat. Halper’s collection also featured many stolen Hall of Fame letters also addressed to August Herrmann by notables like Christy Mathewson, Miller Huggins and Hughie Jennings. To the left is a letter dated Feb. 10, 1925 to Herrmann from Emil Fuchs that is still present in the Hall of Fame's files. To the right is the Fuchs letter from July, 1926, that sold at Clean Sweep Auctions in 2009. Hall of Fame spokesman, Brad Horn, failed to respond to phone and email inquiries regarding the Clean Sweep sale of the Breadon letter addressed to Herrmann. The Hall of Fame has also failed to respond to several inquiries as to whether they have recovered any of the other Herrmann documents removed from auctions in 2010. The National Baseball Hall of Fame and Museum is a 501 (c) 3, independent, non-profit, educational institution. All of the artifacts in the Museum’s collections are the product of generous donations made by players, executives and baseball fans alike. The donated materials are not owned by the Baseball Hall of Fame, rather they have been placed in a public trust and owned by the people of the State of New York. To date, the Albany, New York, office of the Federal Bureau of Investigation, through their spokesperson, Special Agent Paul M. Holstein, has also declined to either confirm or deny that there is an open investigation into the Baseball Hall of Fame thefts. Sources indicate they are doubtful that any such investigation has commenced. Ironically, the Clean Sweep auction description of the purloined Sam Breadon letter sums it up best. It states: “Almost a HOF(er) on the last go round, this will be very pricey if this occurs.” Of course, the auction house is alluding to Breadon’s possible induction into the Hall of Fame. The letter that is currently priced at a meager $165 might skyrocket into the thousands if Breadon is ever inducted. Regardless of his induction, one thing’s for sure: The 1924 letter from Sam Breadon to Garry Herrmann deserves to be back in Cooperstown, even if the man who wrote it may never make the cut. This 1913 letter to August Herrmann from National League President John Heydler was sold by Clean Sweep Auctions in 2009. The letter originates from the HOF's Herrmann Papers and should be found in "Box 40, Folder 10." That file includes all correspondence between Heydler and Herrmann from 1910 to 1913. Is Mr. Jeff Idelson reading this? It is a rotten shame, but the HOF is getting worse and worse every year and when they accepted the Barry Bonds steriod ball there,that really proved how in plain English, they dont give a damn. I’m amazed that the Hall of Fame takes no action against those selling items stolen from the Hall. How else could the robbers ever be located and punished? The Hall of Fame is very concerned about who “gets in” the Hall every year, so how could they not be concerned about what has “walked out” of the Hall years ago. Disgraceful. Back in the 1980s Hall of Fame historian Cliff Kachline (a founding member of SABR) brought to public attention the fact that the Commissioner’s Office had taken items lent to them by the Hall (i.e., World Series programs) and sold them to auction houses. The HOF board of directors responded immediately… by cashiering Kachline. The Hall has never been terribly principled about what happens to their items. Would have loved to read his thoughts on this issue. I don’t think Cliff would be too surprised with the recent actions of the HOF. I ran shows in the 80’s thru 08′ and we had a dealer in the early-mid 80’s thru late 80’s named “Bud Clark”. Bud had inexpensive cards for sale until the mid-80’s when he started displaying for sale some awesome items like a run of World Series pins, early 1900’s season passes made of silver, and amazing cabinet sized vintage HOF player photos. He almost always had signed Ruth balls and lots of great early memorabilia. A sudden change of inventory for a guy that obviously could not afford such items. He bragged to all of us (I was the promoter) that his son was working at the Hall of Fame. Some dealers in the show circuit swore there was a connection. I never thought about it all these years until I started avidly reading this web site! I wonder what really went down back then!